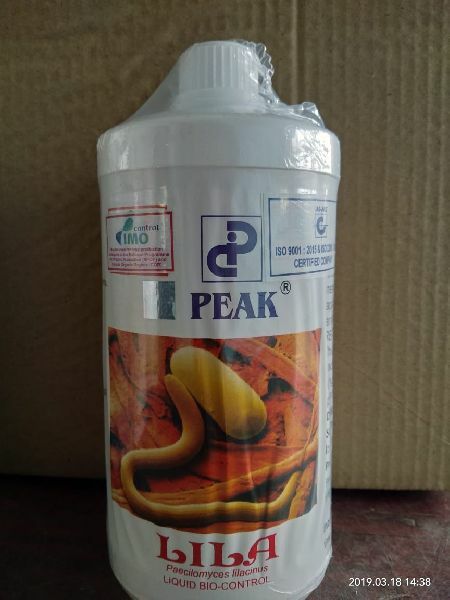 PEAK- LILA is a bio-nematicide useful for the mananagement of Root Knot nematode, Reniform nematode, Citrus nematode. Peak- Lila infects and assimilates eggs of root-knot and cyst nematodes. Peak Lila has a great potential for application as a biological agent in sub- tropical and tropical agriculture soil. Recommended For : This product is recommended for Tea, Coffee, Paddy, Barley, Sorghum, Cotton, Tobacco, Oats, Ginger, Turmeric, Vegetables, Fruits, Flower plants and potato. Soil Drenching : Drench collar soil with 200 ml in 200 Itr water or mix with manure in pits. Precaution : Peak Lila is not compatible with chemical fertilizer, fungicide or insecticides. Note : Entire content of the pack should be used in one time.